DISTRACTION is one of the leading causes of fatal road crashes in Australia but new hi-tech detection cameras that catch drivers using their mobile phones without them even knowing could soon change everything. A New South Wales Police spokesman told news.com.au that officers currently “use a variety of methods to detect drivers using their phones while driving”. “Line-of-site, by trained officers is the primary method of detection, however, long-ranged cameras have been used with success, and helmet cameras in motorcycle police continue to be used,” the spokesman said. But that technology could soon be replaced by fixed position cameras that automatically issue an infringement notice without the driver even realising they’ve been sprung. NSW Police Highway Patrol boss, Assistant Commissioner Mick Corboy, told the Nine News there were “emerging technologies coming out”. “So the way we are going to defeat this is by video evidence, by photographic evidence and we are looking at everything possible around the world at the moment and we think we’ll get something in place fairly quickly,” Mr Corboy said. His comments came after NSW Minister for Roads Melinda Pavey put out a call on Tuesday for potential providers to present “practical, technology-based solutions to address the problem” of mobile phone use in cars. “Developing this technology would be a world-first and is one of the priorities of our Road Safety Plan 2021 that we announced,” Mrs Pavey said. As part of the Road Safety Plan 2021, the NSW Government outlined its plans to implement legislative changes to allow camera technology to enforce mobile phone use offences. Mrs Pavey said the Road Transport Legislation Amendment (Road Safety) Bill 2018 was introduced into the NSW Legislative Assembly on March 6, 2018. NSW is the first jurisdiction to introduce such legislation in Australia. Last year, NSW Police handed out about 42,000 fines to drivers caught on their mobile phones, with the distraction increasingly emerging as a factor in fatal crashes over the past decade. In February this year, serial texter Jakob Thornton, was allegedly engrossed in his phone when he ploughed into a roadside breath test in southwest Sydney, seriously injuring two officers. Senior Constable Jonathon Wright had his foot and part of his lower leg amputated and Senior Constable Matthew Foley suffered a broken leg. Alex McCredie demonstrates how the hi-tech cameras that can detect drivers using mobile phones work. Picture: Mark Stewart. According to National Road Safety Partnership Program (NRSPP) Manager Jerome Carslake, the most common causes of road fatalities and car accidents occasioning serious harm are fatigue, speed, distraction (including mobile phones), and alcohol or drugs. During the 12 months ending in February 2018, there were 1249 road deaths across Australia. That was a 0.2 per cent decrease compared to the total for the 12-month period ending February 2017. In 2016, 1300 lives were lost on roads nationwide, which was an increase of nearly 8 per cent on the previous year (1205). Mr Corboy said in a statement earlier this month that too many people made “poor decisions” while driving. “Every fatal crash is a tragedy for not only those involved, but for the families they leave behind,” he said. In NSW, motorists caught using a mobile phone while driving can be slapped with a $330 fine and a loss of four demerit points, regardless of whether they’re repeat offenders or not. The Australian Capital Territory has some of the toughest laws in the country, with a fine of $528 and loss of four demerit points for a driver caught texting or using social media behind the wheel. Like the ACT, Western Australia also has a separate specific offence for motorists caught texting while driving. “WA Police Force is constantly looking for new ways to target offences frequently linked to serious and fatal crashes on our roads, including inattention through mobile phone use,” a WA Police spokesman told news.com.au. This driver was booked by Acting Sargeant Paul Stanford for using a mobile phone while driving in Brisbane City and copped a $378 fine. Picture: Jamie Hanson. In Queensland, motorists can be fined $378 and have three demerit points recorded against their traffic history if they are caught holding a mobile phone for any reason while driving – that includes when they’re stopped at traffic lights or in congested traffic. Learner and P1 drivers are prohibited from using hands free, wireless headsets or a mobile phone’s loudspeaker function. “At this time the QPS does not have technology to detect drivers using mobile phones,” a QLD Police spokesman told news.com.au. Double demerit points apply for second or subsequent mobile phone offences committed within one year after an earlier offence. A hi-tech camera which can detect people using their mobile phones while driving was trialled in Melbourne last year. Picture: Mark Stewart. A red-light style camera capable of photographing drivers illegally using their mobile phones was trialled in Melbourne, Victoria last year. The technology – touted as a world first – detected 272 culprits during a five-hour test across just one lane of the Eastern Freeway, the Herald Sun reported. The trial revealed that 7.1 per cent of the drivers observed infringed phone use laws. And 65.8 per cent of those offences related to motorists actively using their phone by holding it or touching it in a cradle. Authorities said in December last year that they were always looking at ways to improve road safety but had no current plans to introduce the technology. This driver was booked for using his mobile phone whilst driving in Brisbane. Picture: Jamie Hanson. A South Australia Police spokesman told news.com.au the state “doesn’t yet have any technologies to assist in the detection of driving while using mobile phones”. As of November 11, 2017, the fine for using a mobile phone while driving was $327 plus a $60 government levy – totalling $387 coupled with three demerit points. Drivers are permitted to touch their phones only if they are making or receiving a call on a device mounted to the vehicle. “To avoid doubt, nothing … authorises a person to use a mobile phone by pressing a key on the device, or by otherwise manipulating the body or screen of the phone, if the phone is not secured in a mounting affixed to the vehicle,” the legislation reads. The SA Police spokesman said it was “lawful to pull over to the side of the road to a place where it is legal to stop and make or receive a telephone call”. “There is no requirement to turn off the engine,” he said. “Although the rule that relates to mobile telephones does not say that the vehicle must be in an area where it is legal to park, other Australian Road Rules come into play. Acting Sargeant Paul Stanford speaks to a motorist in Brisbane City. This entry was posted in Australia, CAMS PHOTOS, MOBILE PHONES, POLICE EQUIPMENT, TECHNOLOGY, TRACKING, TRAFFIC ISSUES and tagged beware big brother in watching mobile phone drivers, catch cam phone use, mobile phone user drivers beware on April 14, 2018 by Henry. Police launch Operation Roam in the hope of getting the community to assist with catching 18 individuals on the run from the law. The country’s most wanted offenders are currently at large and possibly hiding in plain sight in communities across the nation, according to Crime Stoppers Australia. Operation Roam: Rogue Radar kicks off today (August 21-27), in an attempt to catch Australia’s most wanted. “The individuals named in this year’s Operation Roam are responsible for a range of offences, including murder and armed robbery,” Chairman of Crime Stoppers Australia, Trevor O’Hara said. Last year 19 persons of interest were named as part of the campaign. Of those police were able to locate and arrest 11 offenders. This year four fugitives are wanted in New South Wales, six in Queensland, six in Victoria, three in South Australia and one in the Northern Territory. “We urge members of the public to visit http://www.rogueradar.com.au to see if they recognise any of these faces and report anything they know about these individuals. If you have any information on anyone on the Rogue Radar list, contact Crime Stoppers on 1800 333 000. This entry was posted in Australia, CAMS PHOTOS, PEOPLE, Police Videos, WANTED and tagged images of most wanted men in australia, lookout for these wanted men in australia, most wanted on the run in australia, police mug shots of most wanted men on the run in australia, police search for these 18 wanted men on the run in australia on August 23, 2017 by Henry. Selfie Absorbed: Gilbert H. Phelps, 20, of Iowa City, Iowa, was pulled over for speeding, but was arrested on charges of driving under the influence. Police say Phelps admitted to smoking pot, and was “measurably impaired” in his driving. While going through sobriety testing at the station, Phelps asked if he could take a “selfie” with the officer for posting on Snapchat. “To which I happily obliged,” the officer noted in his report. Phelps added “stickers” to the photo to illustrate police cars pulling him over. (RC/Cedar Rapids Gazette) …Which is an automatic fail. This entry was posted in CAMS PHOTOS, DRUGS, JOKES CARTOONS, USA and tagged iowa ploice pot smoker selfie, selfie pot smoker, selfir pot smoker in iowa, smoking pot selfie on September 5, 2015 by Henry. When one thinks about police being ‘tax collectors’ & stuff like that one can easily lose site of the fact that they are part of the system & have a job to do.They have to perform their duties as directed by their superiors & government [voted in] ministers [Who in most cases are not fit or qualified to make the decisions they make]. However yours truly has had the pleasure of interacting with police people of late [Today] & was extremely impressed with their beautiful natures but professional friendliness. They did so with no threatening manner or stand over approach as has been stated by some at times.Their approach to me was merely to get in contact with some lady I know that has a connection with me [As per the police data base] & wanted to know how to contact her. I made it easy for them in saying that I will be seeing her during the day & will pass on the message & the officers will ring me later that day to confirm that she has been notified. Yes the officers did front up to us in the monthly flea markets at Maryborough Qld & needed to confirm that I had passed on the message & spoke to my lady friend direct. In the absence of a clear mind [due to the consumption of some fine wine]-[www.foodpassions.net] I will just post some pics here & get back to finishing the story later. This entry was posted in Australia, CAMS PHOTOS, NICE PEOPLE, PEOPLE, TRUE STORIES and tagged mark from the maryborough police station, mark hathaway we love you, marks for the marks police of maryborough qld australia, police force in maryborough queensland, the mark police cometh from maryborough, the marks brothers of australia, the marks police cometh on August 13, 2015 by Henry. More frontline police opt to buy their own personal body-worn cameras. POLICE are looking to internet giants Microsoft and Amazon to solve a dilemma over how to store huge amounts of video footage captured by officers on the job. A three-month trial was launched by police this month to establish just how costly a solution to the big data problem is likely to be before going out to the market. It comes as an increasing number of frontline police opt to buy their own personal body-worn cameras to cover themselves against vexatious complaints while on duty. The trend has created a headache for the police service, which has been criticised for a policy forcing officers to upload footage to police computers unable to cope with the huge file sizes. Chief Superintendent Dave Johnson said officers needed to be able to transfer the footage quickly. “We’ve looked at options around the big players, the Microsofts and the Amazons, just to try to estimate what the storage cost is,” Chief Supt Johnson said. “One of our primary objectives in Queensland is to keep frontline officers in the field so we are very mindful that any solution we come up with can’t take officers away for a long period of time at the end of shifts to move the video footage from their device into the cloud storage,” he said. Chief Supt Johnson said a $74,000 pilot program was being trialled by a small group of police on the Gold Coast to determine just how much data a broader body-worn video program would involve. An intelligence officer, helicopter officers and a break-and-enter taskforce are taking part in the trial. The trial is using a program by West End-based firm Cutting Edge backed by Amazon’s Cloud-based archive storage servers. Police say the trial was planned for last year’s G20 but was delayed. Expanding its existing in-house data storage used by forensic officers is an option, but Chief Supt Johnson said a Cloud-based solution “seemed to be the way to go”. Any rollout of body-worn video would rely on funding approval from the Palaszczuk Government, which made a pre-election pledge to spend $5 million on police cameras. 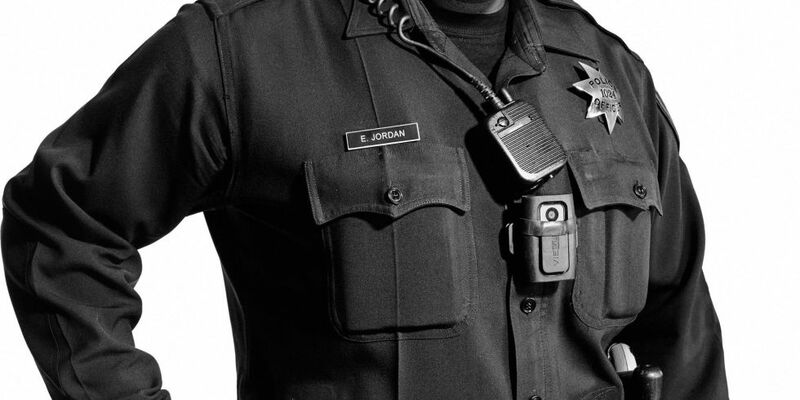 An internal police department report recommended – as early as 2011 – body-worn cameras be used. This entry was posted in Australia, CAMS PHOTOS, POLICE EQUIPMENT and tagged body cameras for queensland police, police body cameras in queensland, police equipment & body cams on May 3, 2015 by Henry. 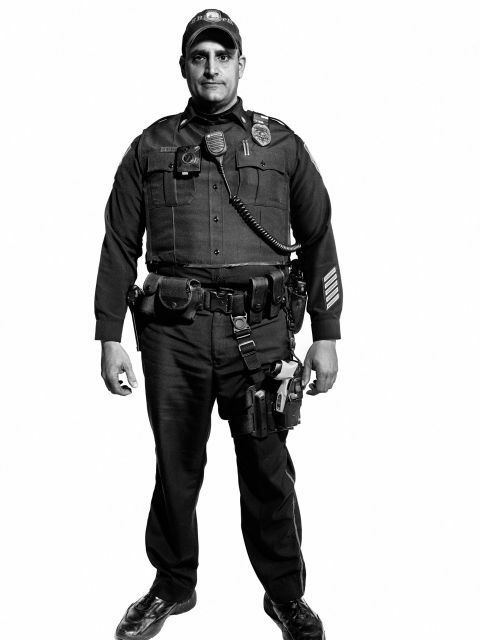 A technological revolution is changing the way American police fight crime. In Oakland, in Ferguson, and in other towns around the country, digital cameras log their every move—and ours. “There was some skepticism at first, but the officers have been won over. They really see the value in it. The cameras show that they are hardworking and do the right thing consistently. There are other factors to attribute this to as well, but over the last two years we’re looking at a more than 50 percent reduction in complaints. Those complaints that do come in, we’re able to resolve them a lot faster. And while occasionally we’ll catch somebody doing something they shouldn’t be, the video evidence used in complaints overwhelmingly supports the police—more than 90 percent support the officer. “It used to be that you turn on the camera when you get out of the car to walk up to the car you’ve pulled over. We realized that works great for your routine car stop, but it does not work if it becomes a pursuit. So now, before you even attempt to make a car stop, you turn on the camera. “The cameras are not perfect. They show a frontal view from the direction the officer’s chest is facing, but that doesn’t necessarily mean the officer is looking in that direction or that he isn’t talking to somebody at his side. Also, nighttime video is not great. The technology may improve, but you don’t want better vision than the officer is capable of seeing either, because then there’s no way to know what the officer actually saw. 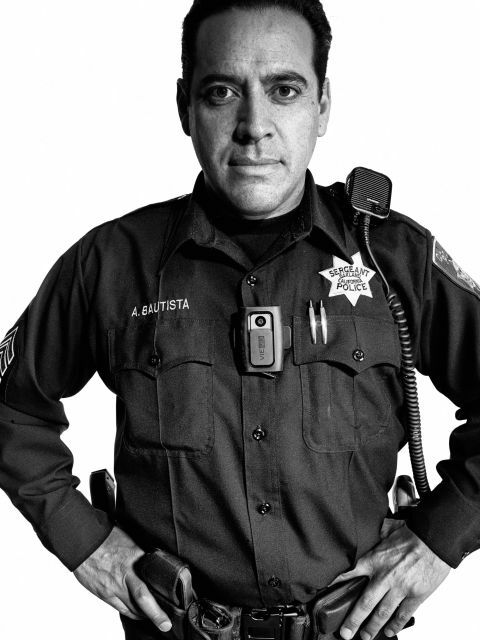 Two companies dominate the wearable camera market for law enforcement: Vievu and Taser. This waterproof 2.8-ounce Vievu camera has a five-hour battery life and sixteen gigabytes of internal memory—enough to hold six hours of HD footage or twelve hours of standard-definition. According to Vievu, the 68-degree field of view limits image distortion and provides a closer and larger picture. In Oakland, unless it is being used in an active case, footage is currently stored for two years. This entry was posted in CAMS PHOTOS, POLICE EQUIPMENT, Police Videos, VIDEOS MOVIES DVD'S AUDIO on April 4, 2015 by Henry. Los Angeles Mayor Eric Garcetti announced this week that the city has signed a contract to buy 800 TASER International Axon body cameras, using $1.5 million raised from private sources. 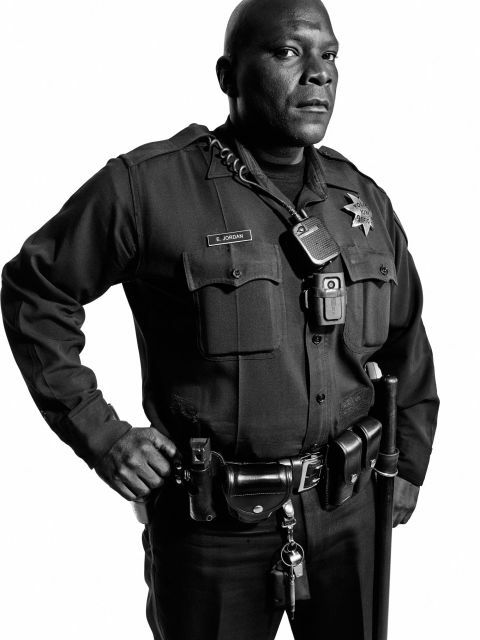 In addition, the city plans to buy and deploy another 6,200 body cameras this coming year. 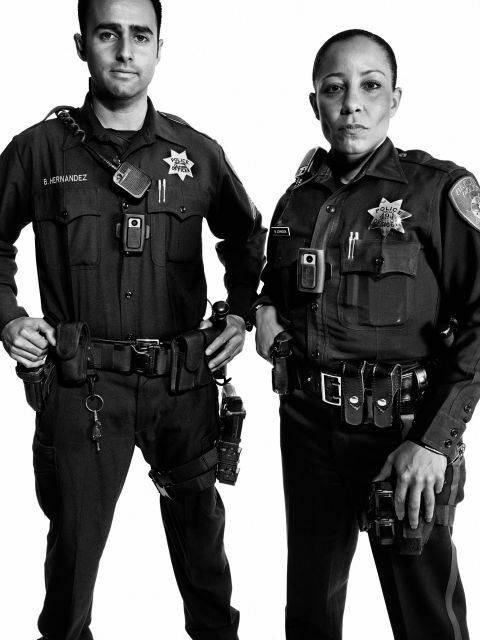 TASER is one of the top four vendors in the body camera market, and the company’s Axon cameras are in service with numerous police departments, including San Francisco and San Diego. Axon has a 130-degree lens with a 640 x 480 resolution and a 14-hour battery life. Incidents are digitally recorded on the camera and then uploaded to a cloud-based service called Evidence.com. That’s the main selling point for Axon, TASER CEO Rick Smith says—it relieves police officers and departments of having to upload all this footage themselves. Following the Ferguson grand jury’s decision not to indict Officer Darren Wilson for the Aug. 9 killing of Mike Brown, President Obama promised that the federal government would set aside $75 million in matching funds to help law enforcement agencies purchase body 50,000 cameras. Of course, that won’t stop an officer from turning off his camera, but such an action wouldn’t look too good for the cop, Smith says. Besides, no system is foolproof. This entry was posted in CAMS PHOTOS, EQUIPMENT, POLICE EQUIPMENT, USA and tagged animal skin belts for police, body cams for police, lapd to have body cams, p[olice to have body cameras, police body cameras sold, police to have body cameras on them on December 25, 2014 by Henry. Long before the Ferguson grand jury’s decision not to indict officer Darren Wilson for the Aug. 9 shooting death of Michael Brown, which this week prompted President Obama to call for more body cameras to record police activity, departments around the country had been looking at acquiring more of these devices. But with the President’s promise to provide federal funds, the pace of adoption is about to speed up greatly. “If the federal government puts another $75 million into this and puts another 50,000 cameras in the field, that would significantly accelerate the pace at which the markets are moving,” says Rick Smith, CEO of TASER International, which makes AXON body cameras. According to Smith, some police unions have resisted body cameras, thinking they might be used as a gotcha device to punish cops who made innocent mistakes. But things are changing because of Ferguson—the controversy convinced many police officers that body cameras protect them too, Smith says. 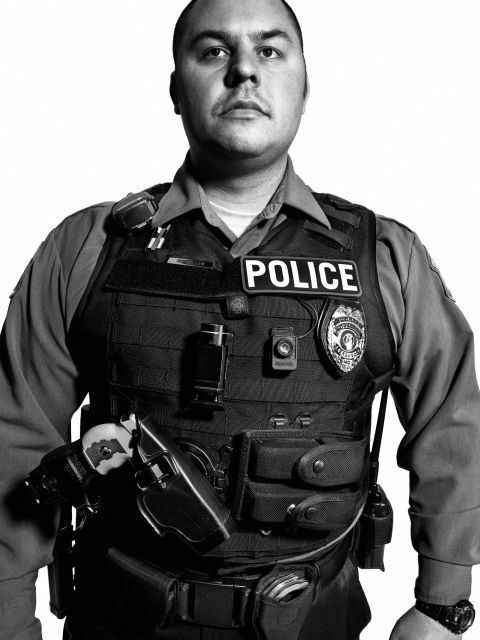 “You now have officers say, ‘I don’t want to be Officer Wilson. I want a camera, so I can show my side of the story,’” he says. The top three players in the body camera market are TASER International, VIEVU, and Digital Ally. TASER offers two types of AXON cameras. 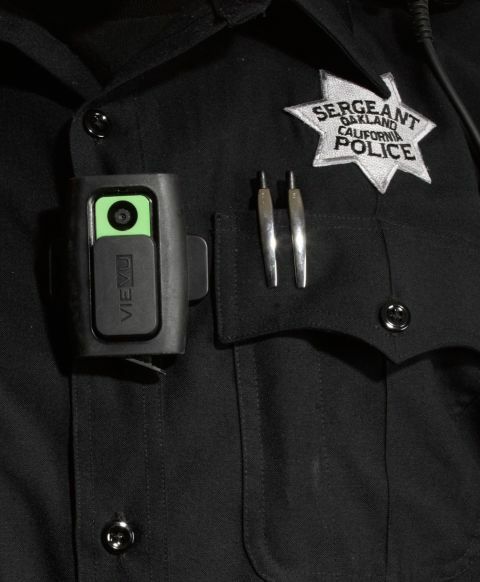 One is a compact body camera, smaller than a deck of cards and worn on the officer’s chest. The other, AXON flex, connects by wire to a lens that can be magnetically mounted to a pair of Oakley sunglasses. This layout allows the camera to turn with the officer’s head. Both AXON cameras have an internal digital storage of 8GB and a battery life of about 14 hours, so the devices won’t die during an officer’s shift. They capture a wide field of view through a 130-degree fisheye lens. The resolution is just 640 x 480, because HD puts demands on storage, bandwidth, and battery power. “The reason why we chose not to go HD on the camera is because it makes your files sizes 5-10 times larger,” Smith says. TASER head-mounted AXON Flex camera. 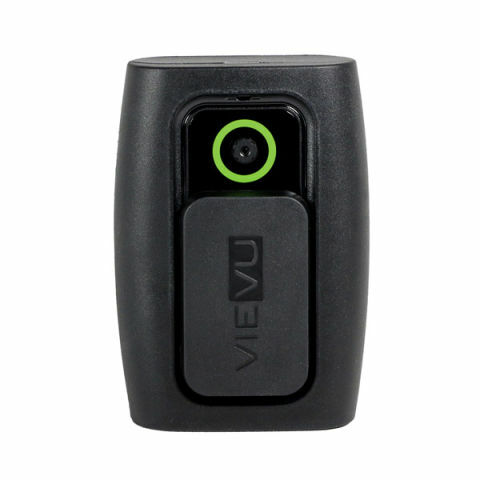 By contrast, rival provider VIEVU offers a 1280 × 720 LE3 body camera. Company president Steve Lovell says the high definition is advantageous when “when it comes to courtroom evidence.” That tends to produce larger files, but the VIEVU camera has 16GB of internal memory and 12 hours of recording time thanks to an extended battery pack. The LE3’s field of view is just 68 degrees, much smaller than TASER’s. That’s deliberate, VIEVU officials say—they designed the camera without night vision, infrared, or a fisheye lens because it is meant to record just what the officer would be able to see, Lovell says. Because it would generate too much data and drain the batteries, these cameras aren’t recording non-stop. But that’s a problem—if an incident were to catch an officer off-guard, it could be halfway over by the time he or she can turn on the camera. 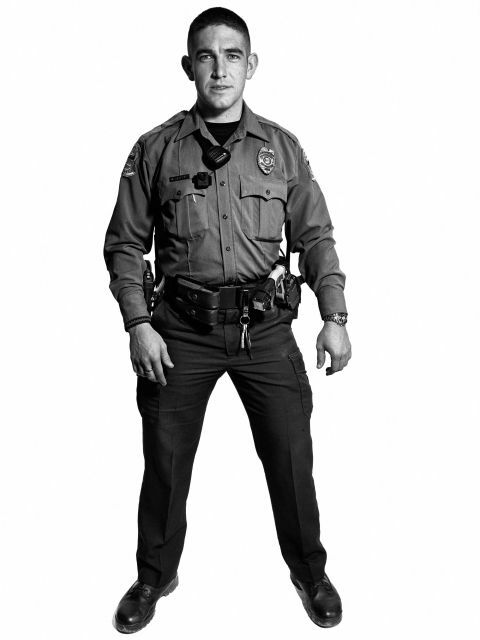 For such situations, the TASER AXON cameras have a buffering capability that records the 30 seconds of activity that happened before the police officer turned on the camera. The VIEVU LE3 lacks that buffering capability, but Lovell says there’s a reason. “When the officer does not have direct control over the start/stop of the recording, the Officer may accidentally record in a location that is illegal,” Lovell says. Smith says the AXON camera system does not record audio during buffering mode, so non-work conversations will not be recorded. In addition, there’s a privacy function that allows the officer to stop all audio and video recording. AXON’s police cams generate 2GB of data per officer per day. That’s evidence. “You can’t just use Dropbox or some sort of consumer application to store your files,” Smith says—there has to be a secure, tamper-proof way to store data that adheres to the rules safeguarding the chain of custody. AXON uses its cloud-based, subscription service called Evidence.com. VIEVU offers its own cloud-based solution, VERIPATROL Cloud, but doesn’t require it as part of the camera system, Lovell says. Both systems rely on digital signatures to safeguard against tampering. A 2012-2013 study conducted with the Rialto, Calif., police department found that wearing body cameras resulted in a 60 percent decline in the use of force by police and a whopping 88 percent drop in citizen complaints against officers. 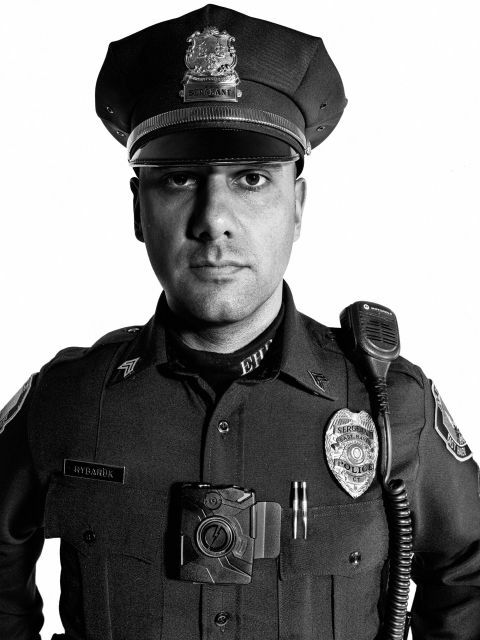 For those outside the industry, the call for more body cameras “sounds good in theory, but the details matter and implementation issues abound,” says Patrick Eddington, a civil liberties and homeland security policy analyst at the CATO Institute, in Washington, D.C.
More broadly, it reflects a breakdown in public trust of law enforcement. “Technology alone can’t fix that problem,” he adds. 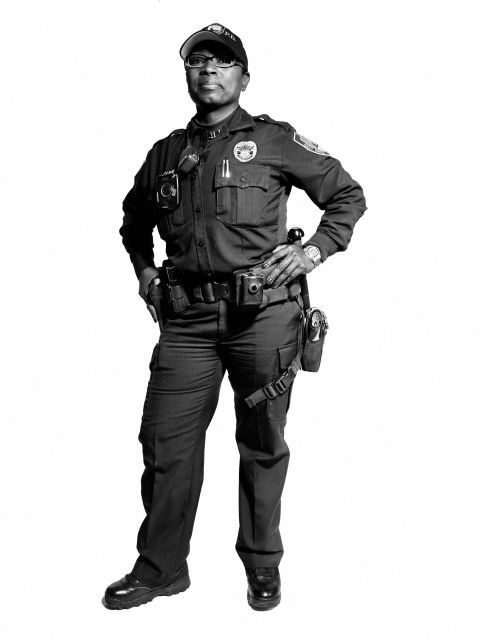 “Only a return to demilitarized, community-grounded policing practices—with stringent and effective oversight mechanisms—will help rebuild trust between law enforcement and the communities they serve. This entry was posted in CAMS PHOTOS, POLICE EQUIPMENT and tagged body cameras for australian police, body cameras for police, police body cameras, the obama police body cameras, the use of body cameras on police on December 7, 2014 by Henry. A record spike in drivers intentionally altering their plates has prompted a dramatic fine increase. West Australians who deliberately obscure their number plates risk a $1000 fine, up from the current $50 penalty. Acting police minister John Day said on Sunday that a record spike in drivers intentionally altering their plates had prompted the dramatic fine increase. Mr Day said the most likely reason for the spike was hoon drivers trying to prevent detection from speed and red-light cameras. “They could also have outstanding warrants, not have a licence or be part of an organised crime syndicate and want to deliberately avoid detection,” Mr Day said. Mr Day said drivers were installing flipping mechanisms, remote controlled shutters , using protective films and bending the corners of plates to avoid getting caught. Opposition spokeswoman for police Michelle Roberts said while she welcomed the fine, the government had been slow to introduce a meaningful deterrent for a problem raised years ago. A spokeswoman for Mr Day said the fine had been implemented since September 26 as part of a raft of penalty changes. She said the government would start to receive information on how many people had been fined in about a month. It seems that the latest number plate reading devices have instigated a concern that number plate reading by police would be difficult if number plates were distorted in some way. Refer our earlier article on number plate reading devices. This entry was posted in CAMS PHOTOS, NUMBER PLATES, REVENUE RAISING and tagged altering number plates, avoid fines do not wash your car, avoiding number plate fines, avoiding number plate reading detection, japanese mud sprays for cars, mud on number plates, number plate issues, number plate sprays on October 12, 2014 by Henry. THERE’S having fun on the job and then there is this. Reykjavik’s metropolitan police department has become a viral sensation with their Instagram account, gaining more than 82,000 followers online. And why wouldn’t you follow a police force whose days seem to consist of taking goofy selfies, hitting the gym, scoring a hipster cup of coffee or getting around on bikes? There’s even a Baywatch style #DavidHasselhoff shot, there are kittens featured, and the occasional reflective music clip thrown in. Maybe the Australian Federal Police could take a leaf out of their book ? Take a look at the rest of them here. This entry was posted in CAMS PHOTOS, POLICE METHODS and tagged funny photos of the Reykjavik’s metropolitan police department, instagrams of the Reykjavik’s metropolitan police department, Reykjavik’s metropolitan police department does it well, the funny Reykjavik’s metropolitan police department, who are the Reykjavik’s metropolitan police department on October 4, 2014 by Henry.